Our Moor House care home in Staines has launched a monthly parent and child group called Wisdom and Wonder. The group welcomes parents and their children in to the home to spend time with residents, play and socialise. 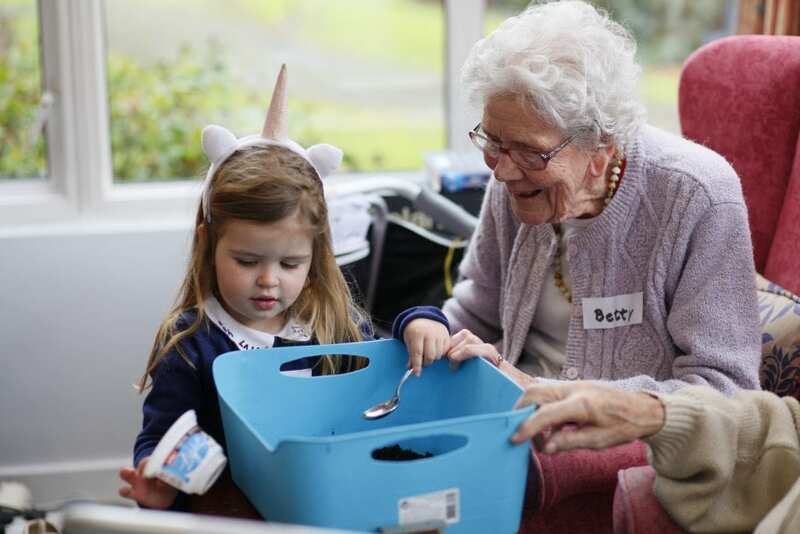 Each month, the group comes in to the home for a couple of hours and the children play with toys, interact with the residents and take part in activities such as singing, painting and planting seeds. Wisdom and Wonder gives parents the opportunity to catch up with one another and the residents over hot drinks, whilst the children play with one another. Residents at Moor House have been really pleased to join the group and many sit watching the children play and speak with the parents. One resident said how much they enjoy spending time with the children and watching them play. To find out more about our Moor House care home, click here. We’re always on the lookout for exceptional health care assistants across our homes. We offer competitive pay, excellent benefits and the chance to work in a dedicated, caring team. Click here to find out what vacancies are near you and be part of our team at Friends of the Elderly.